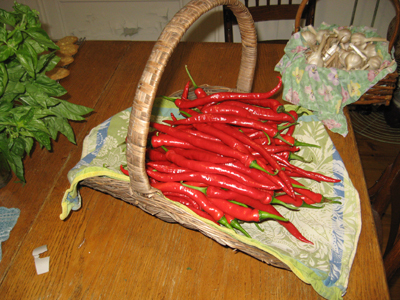 I spent yesterday with 2 of the four varieties of peppers that I grew this season. (Not quite “The Five Little Peppers and How They Grew,” by Margaret Sidney, but close.) 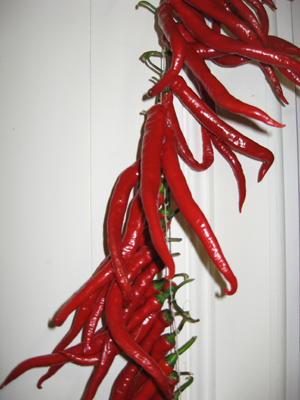 I will start with how I ended: with “Andy F1,” the hot drying “ristras” pepper. I planted 9 seedlings of this plant in the spring (seeds from Johnny’s Selected Seeds, in Winslow, Maine), and 8 survived. Each plant is now heavily laden with long, light green peppers that turn brilliant red, it seems, in the course of one summer night. I have been harvesting them with nothing more technical than my fingers. 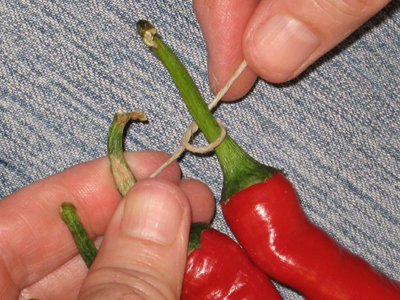 I hold the fruit’s stem where it joins the branch, snap upwards gently, and an 8″ long pepper drops into my hand. As easy as that. I have been collecting them and laying them out on dish towels, until I amassed a goodly amount. My plan is to dry them, and to have them contribute to my decor as they do so. I remembered a charming photo of a lavender “curtain,” from the book “Herbs,” by Emelie Tolley and Chris Mead. Someone had tied bundles of lavender together to dry, and strung them up and around a window. The book claims that as the breeze comes through the window, it carries the scent of lavender with it. (Maybe. That hasn’t been my experience.) But I reasoned that sight is more dependable than scent, and isn’t dependent on the window being open. 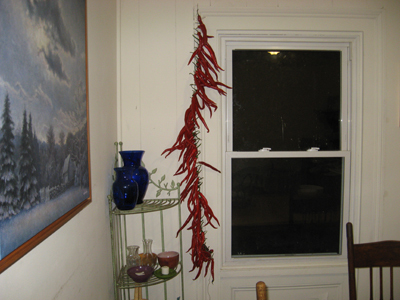 My goal is to frame my two dining room windows with the knock-out color of red from this gorgeous peppers. Will I ever eat them? Who cares! I’m getting a full-measure of pleasure just from looking at them. The first appearance is lovely, a vibrant light green, and a long slender shape. The basket couldn't hold any more, so clearly it was time to start stringing them up. 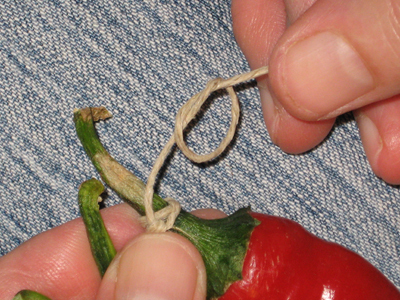 I tried to tie the peppers within 1/4 inch of each other. The twine was nimble enough to allow me to do this. The jazzy blue background? My faded jeans! I'm working on my lap. I tied each stem as tightly as I could, without the twine severing it. I'm guessing that as the pepper dries, the stem will shrink, and I don't want to hear the unwelcome sound of half-dried peppers slipping their bonds and dropping onto the floor. A close look at how they are hanging vertically. The product of one night's effort: the left side of Window #1! 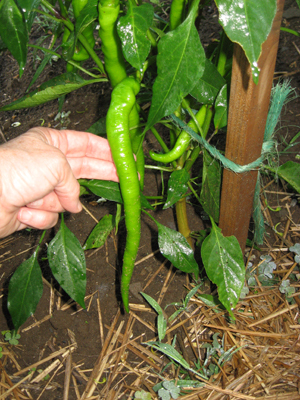 I spent yesterday morning with the jalapeno peppers, and I will share those events and those photos soon. a string of dried chilies, garlic, or other foodstuffs.